Description: Booklet with soft covers. The upper and lower sections of the cover page are grey. 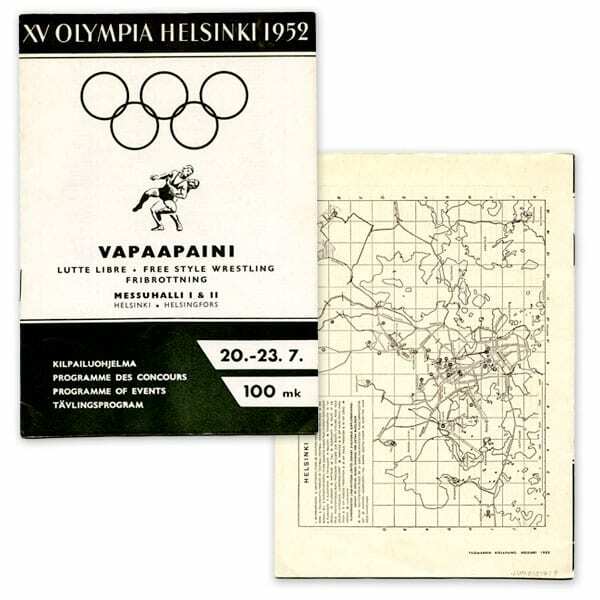 The white middle section features the Olympic rings, two wrestlers and the texts: VAPAAPAINI; LUTTE LIBRE FREESTYLE WRESTLING FRISTILBROTTNING; MESSUHALLI I-II.HELSINKI. KILPAILUOHJELMA 20.-23.7. 100 MK. 19 pages. The map of Helsinki in back cover. Other information: The programme for the competitions in freestyle wrestling on 20-23 July 1952.